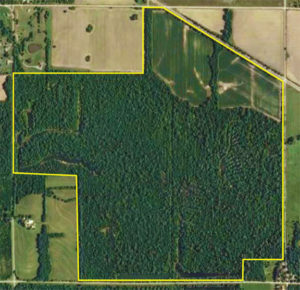 The Southeast Kansas deer hunting lease is most heavily wood covered deer lease in the Association. This is reclaimed strip pit mine land. Those that become accustomed to Kansas trophy deer hunting often comment this land is too thickly covered. Deer movement dispersed. Shot range limited. Too tough to hunt. The comparison is that on more open crop land deer patterns are visible. Funnels easily identified. Shots in range easily set up. Tag-on success rate does support this. The land below does have trophy deer no doubt. It is that more are harvested on less protectively covered land. No where else in Kansas do we have such heavily covered hunting land. Many deer hunters are initially attracted to such wooded land. The Association deer lease is outline by the yellow line. The more common deer hunting land to find in unit 11. This deer lease is scrub or fallow land, some pasture, hay and within its boundary no row crop. Row crop does adjoin on the property lines. Like many leases the property lines are easily identified by fence lines and roads. The fence line to the north and west are examples. Southeast Kansas deer management unit 11 has been a consistent producer to include the top 10 Kansas record bucks. It is within the central lowlands that make up a large river sub basin knows as the Osage River watershed. This region has sufficient rainfall for dry land soybean and corn. Additionally, milo and wheat will be found in this region. 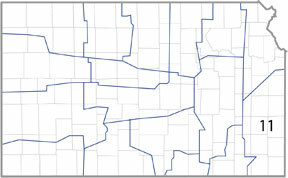 This southeast corner of Kansas is the only Kansas region that allows fall planting of oats. All this means is that the variety of early and late season deer food sources on agricultural land is the most divers of any of the Mid-America Hunting Association private land hunting in Kansas. Unit 11 is also a heavily populated Kansas deer management unit with the cites of Pittsburgh and Fort Scott being the largest. 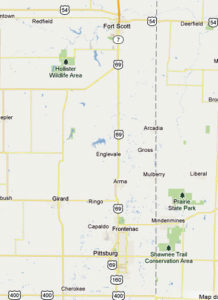 Unit 11 is on the Kansas state line easily allowing a two state deer hunting trip. In this Kansas deer management unit there is not any shortage of hunter support services. Wal Marts, lodging camping, meat lockers and more are readily available.